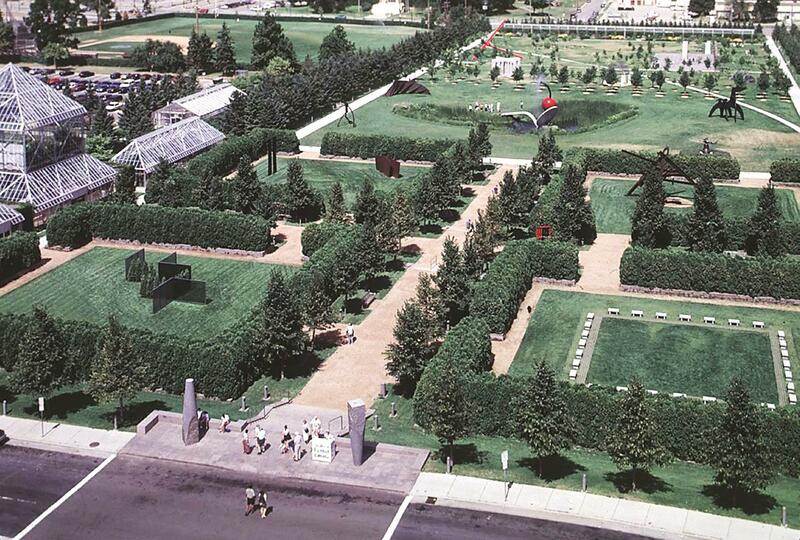 Happy 25th Birthday Minneapolis Sculpture Garden! Sorry, I forgot to inform you of the original air date of tpt’s history of the Minneapolis Sculpture Garden. It premiered last Sunday evening on tpt/MN. The half-hour documentary was made to celebrate the 25th birthday of an extraordinary public space. The program will air again at various times throughout the summer. Check tpt schedules or watch it here. Producer Mark Fischer and executive producer Tom Trow did an excellent job telling the story; they even let me be in it! The Sculpture Garden was a collaboration between the Minneapolis Park and Recreation Board, which owns and maintains the land, and the Walker Art Center, which designed the garden and selected the sculptures. It’s a Minnesota treasure. 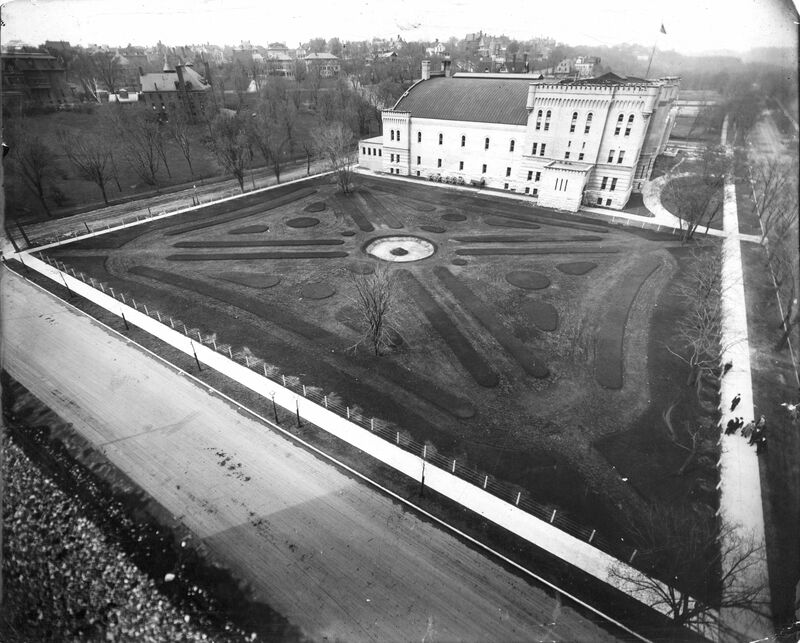 The following photos show the transformation of part of the Sculpture Garden when the Armory Garden was created in 1913. Whether you love the Sculpture Garden, or don’t really care, it is a remarkable use of parkland — one of many examples in the Minneapolis park system. As I said in the video, I think the transformation of one corner of a recreation park into an art park is a remarkable example of how the use of public land can — and should — change over time. It’s another tribute to the wisdom of those who envisioned the park system and the need to set aside land for public enjoyment. Because we own the land, we can adapt its use to meet our needs, however they may be defined and redefined. Brilliant! When’s the last time you visited the Sculpture Garden? Maybe it’s time to take another look. One hundred years ago next week, Theodore Wirth made a request of the Minneapolis park board that made possible one of Minneapolis’s most cherry-ished landmarks—and parks. The park superintendent who was known for his passion for gardens—and also for hiring a talented full-time park florist, Louis Boeglin—asked the park board to approve preparing a square of ground next to the Minnesota National Guard Armory for a garden. At least for a summer. 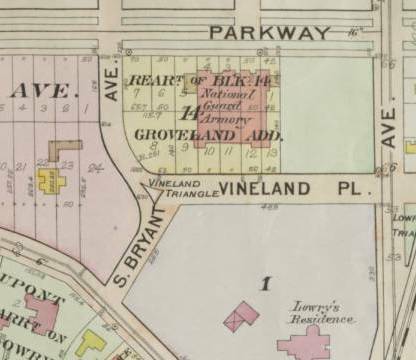 To prepare for this test garden, the board authorized Wirth to provide the property with “the necessary dressing of good loam,” which the board would pay for from funds allocated for The Parade. The Minneapolis Tribune enthused that the garden would be one of the “most beautiful and extraordinary displays that the city has ever enjoyed.” The Tribune estimated (April 20) that some bulbs to be planted, which began arriving from florists around the country in April, were valued at up to $100 each and, therefore, a guard would be posted at the garden site. As the dates of the convention approached much was written in local newspapers about the floral display that would inform and entertain 1,500 guests from around the country who would make Minneapolis the “floral capital of the country” for a week (Tribune, August 10, 1913). Private railroad cars were to bring florists from the major eastern cities and so many florists were coming from, or through, Chicago that both the Milwaukee Road and Great Northern had dedicated trains from there solely for convention goers. The Tribune observed that membership in the Society was “coveted” because there was an “exchange of courtesies” among members, such as the “invaluable service” of a “telegraph order system between cities.” Many of us have used the FTD—originally Florists’ Telegraph Delivery—system, which was created in 1910, only a few years before the Minneapolis convention. The image of Mercury, at left, was first used in 1914. The garden was such a huge hit—with florists and Minneapolis citizens—that one park commissioner recommended keeping the garden and naming it the Wirth Botanical Garden. Wirth, who was vice president of the national society before the convention, was unanimously elected president of the national organization while it was in session in Minneapolis. The park board did support the continuation of the garden the following year and it became a popular attraction for decades, in part because of the labels that identified the plants. But the garden was never named for Wirth. 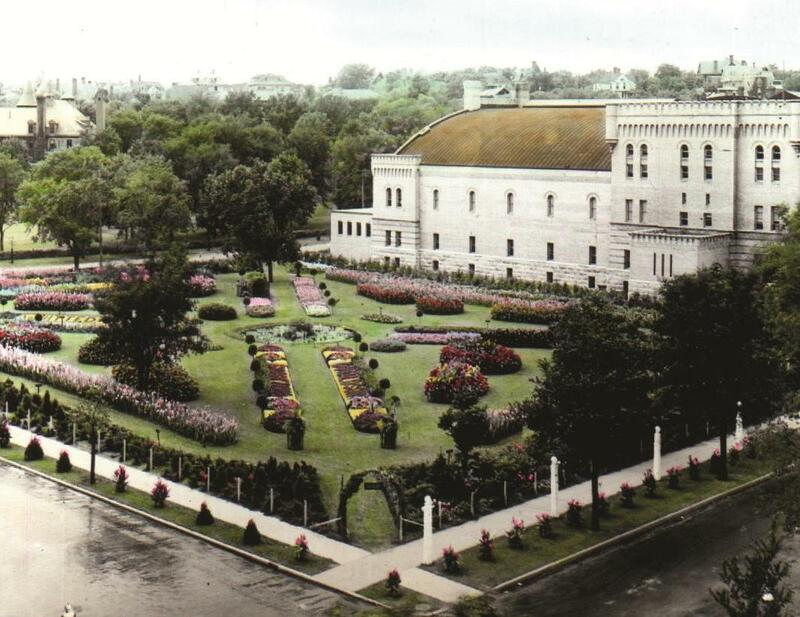 It was referred to as the “Armory Garden” until the Armory was demolished in 1934. 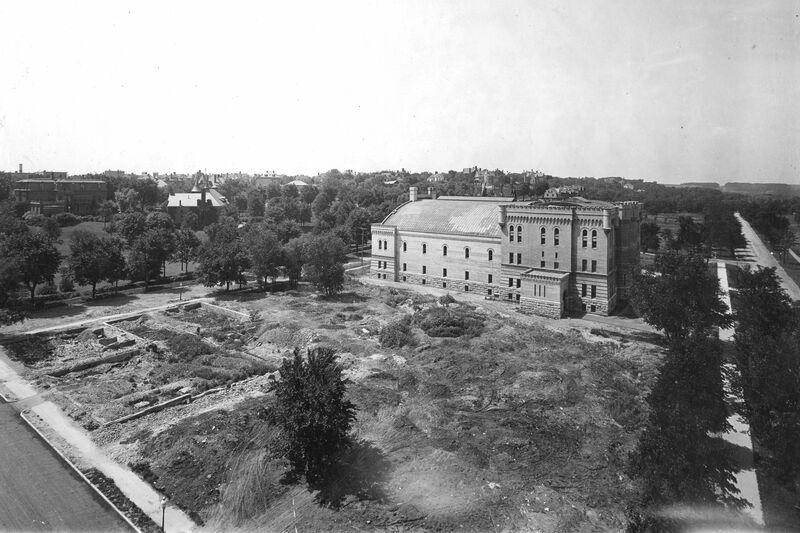 At that time the land where the Armory stood was donated to the park board. After that the garden became known as “Kenwood Garden.” Those floral gardens, introduced as a concept 100 years ago next week, unquestionably facilitated the current use of the grounds as quite a different type of garden. For the rest of the garden’s story, look for a documentary being produced by tpt and the Walker Art Center this spring in celebration of the 25th birthday of the Minneapolis Sculpture Garden. It is scheduled to premier in late May. NOTE May 30,2013: The tpt documentary can now be viewed here.